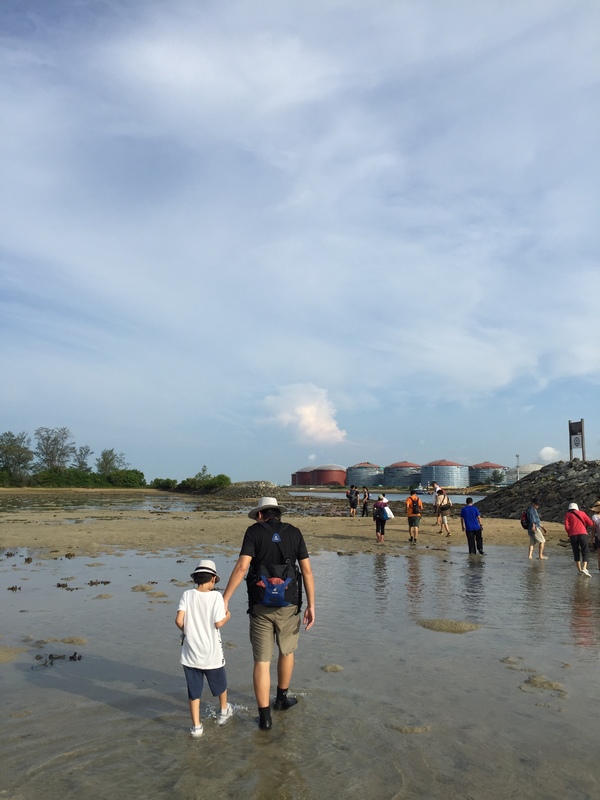 The first LKCNHM SG50 intertidal walk got off to a good start on a very early 9 May morning. Our 39 participants made it on time to the meeting point at Marina South Pier. It was very heartening to see that many have joined our walks before. Our guides were ready too! The weather was very kind to us and we had a good view of the southern islands on the way to Pulau Hantu. It is often very easy to forget that Singapore is actually an archipelago of 63 islands! Boarding the ferry in the wee hours of the morning! All excited to set off! Guides posing for the obligatory photo. Nice ferry ride to the southern islands. Once on Pulau Hantu, we wasted no time getting into our groups and began the walk proper. All of us headed quickly into the intertidal zone and were immediately greeted with an array of interesting marine and intertidal organisms. The sea poison tree (Barringtonia asiatica) bloomed the night before and its beautiful pink flowers covered the grass patch. Even before stepping into the intertidal zone, the coastal vegetation has its own interesting stories. Getting close for a good peek at the tiny marine snails. We could not move too fast. With each step we saw something interesting! Taking pictures of a crab. It was a very fruitful day for everyone. We saw a wide array of interesting organisms such as the feather star, cushion stars, noble volute, nudibranchs, shrimp fish, false anemone fish and even a live giant clam! This rich spread of diversity can also be found in our Singapore waters. In fact just right off the coast, The Hantu Bloggers have been documenting the amazing marine life amongst Singapore’s reefs. Live giant clam! Very interesting to see the symbiotic algae around its lips. Very glad to have chanced upon the noble volute. We got to see exposed corals. Seahorse! We saw a pair! Sponges are very ancient organisms. We rescued a pair of false anemone fish stranded in the tidal pool. Tape seagrass are actually important producers. Towards the end of the trip, we chanced upon an abandoned drift net. Here we saw many animals stranded and struggling. We tried to free as many as we could and managed to extricate one stonefish and about 5 crabs. This lent a sad note to an otherwise happy outing. Abandoned drift nets are very harmful to marine organisms as they trap fishes and crabs. The trapped animals get tangled up and die. Project Driftnet is made up of a group of volunteers who have organised themselves to collect data on where abandoned drift nets and fish traps are found, and dispose of them. We will keep a lookout for the drift net in our next Hantu trip. We managed to free this crab. Though abandoned driftnets are bad news, it was heartening to see our participants jumping in to rescue the trapped crabs and fishes. Till the next SG50 walk! Hope to have another enriching session with our participants.